"First Buck with a Bow"
It finally was that time of year for the annual family bow hunt. My dad, brother, and I head north for a couple days of bow hunting. The trip started off good seeing a lot of deer but nothing close enough to shoot. As the days passed we kept seeing deer and my dad was seeing a couple different bucks that he wouldn't shoot. I said to him that I would shoot any of those bucks because I have never killed a buck with my bow. Being the dad that he is he gave me his stand. The first evening I sat there I saw one of the nice bucks that my dad was seeing but it stayed about 60 yards away and I never got a shot. The next morning I climbed into my dad's stand again. It was the last morning we got to hunt then we had to head home. I didn't see a single deer all morning but at 8:50 that all changed. I looked up and at 75 yards I could see a monster. The deer came straight to the tree at 12 yards. The deer gave me a wide open shot. I buried a Rage broad head in his rib cage. 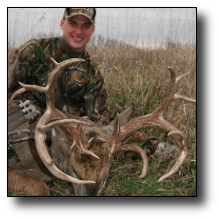 He only ran about 70 yards and piled up. He has 19 score able points and 10 of them are non-typical points. 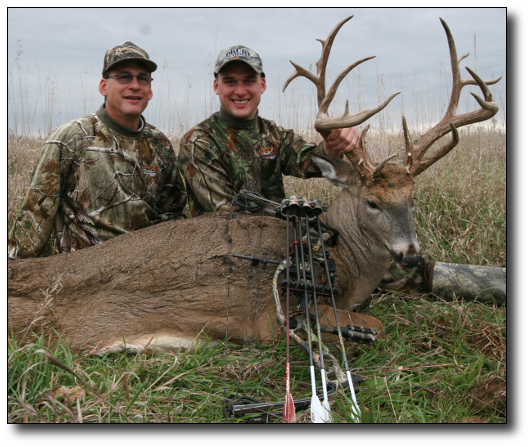 His gross score is 201 6/8" and he nets 194 7/8" as a Non Typical. He had just over 40 inches of non-typical points, 6 inch bases, and beams that both measured right at 26 inches. The best part of the whole hunt was that it was my first buck with a bow and that I made memories that will last a life time with my dad and brother. Unbelievable day in the woods.